I have been having a lot of fun painting with wood scraps on pieces of plywood. 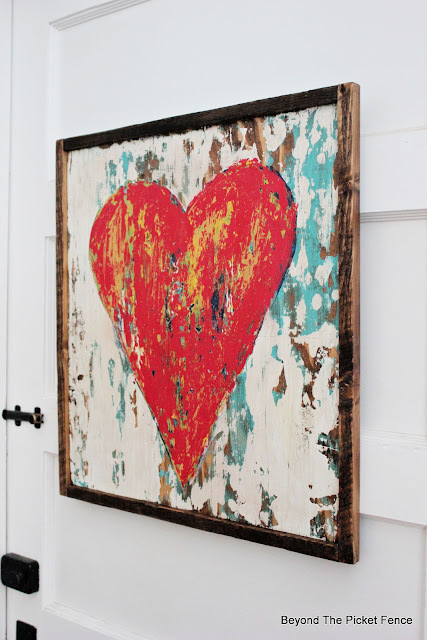 My latest painting was an easy, colorful, rustic heart. Happy Sunday! Have you ever had to wait on someone? Waiting can make us feel annoyed, irritated, frustrated, and angry. Knowing how we handle waiting, it really is amazing to think that God waits on us. While we wrestle with our pride and independence or our feelings of inadequacy and unworthiness, he waits patiently for us to come to him. 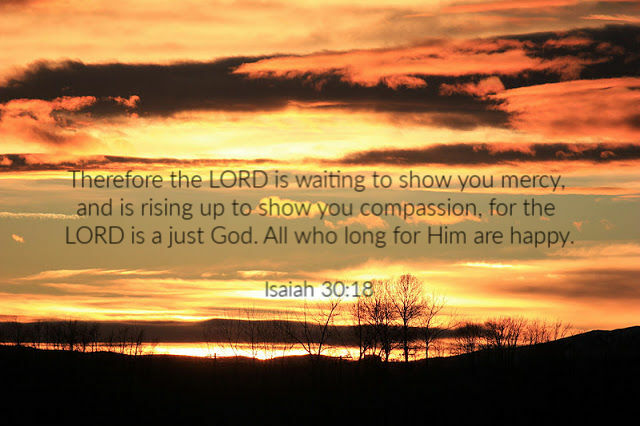 And when we finally do, he does not chastise us for making him wait, but he shows us mercy and grace and compassion. 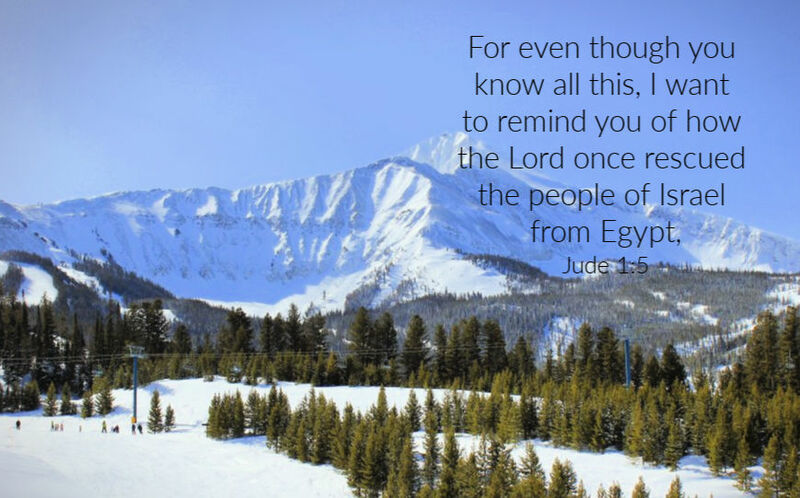 God created us to need him and he longs for us to realize that. When we do, he happily welcomes us with loving arms--no matter how long we have made him wait. My guest room is, well, a hodge podge of leftovers. AND, it has pink carpeting that we would love to tear out. But, until then, I have tried to embrace the pink by decorating with grey and white and few green and pink touches. I decided the room needed a more homey touch. I decided to start with some vignettes for the dresser and night stand. 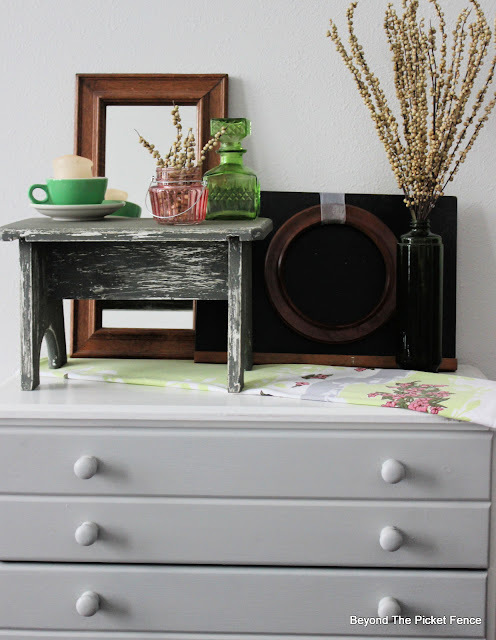 I put some of these, and a few more things purchased previously at the thrift store, to create a cute, farmhouse vignette on the top of the dresser in the spare room. A snowy day gave me the perfect chance to work in my workshop. I wasn't sure what I was going to build. 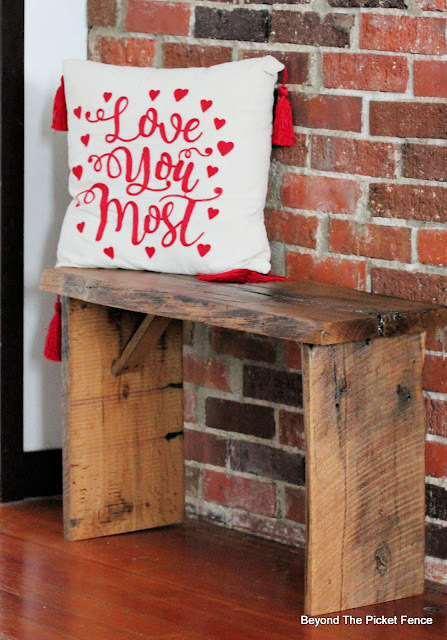 I spied a lovely little piece of live reclaimed wood and decided to make a quick bench. When I say quick--I mean it takes me about 15 minutes to put this together, another 15 minutes were spent on sanding, and about it took about 15 minutes to clear coat this rustic bench. Happy Sunday! Recently, I was recalling a high school ski trip I took with friends. The friends I went skiing with were all much better at it than I was. After feeling frustrated on a challenging to me run, my dear friend made me stop and turn around and look up the mountain. She said, "Look at what you just made it down, you can do this!" Her encouragement kept me from quitting. 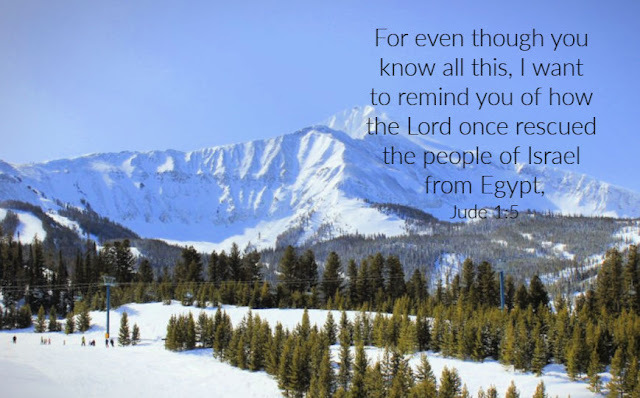 When God's people were feeling discouraged, he often would remind them what he had done for them and the many challenges and hardships they had survived with his help. On the tough days, the days when we are not at our best, the days when we mess up and feel disheartened, we need to remind ourselves that we have made it through other hard days and times. We need to hear God's whisper, "You can do it, I've got you and because I do, you've got this, keep going." I know,it is NOT Thursday. But, even though I actually had this project done Wednesday (that is a tad early for me 😂), I had to wait for some sunshine to get pictures. They are still not great photos--dear daughter's attic room doesn't get much light on this end. 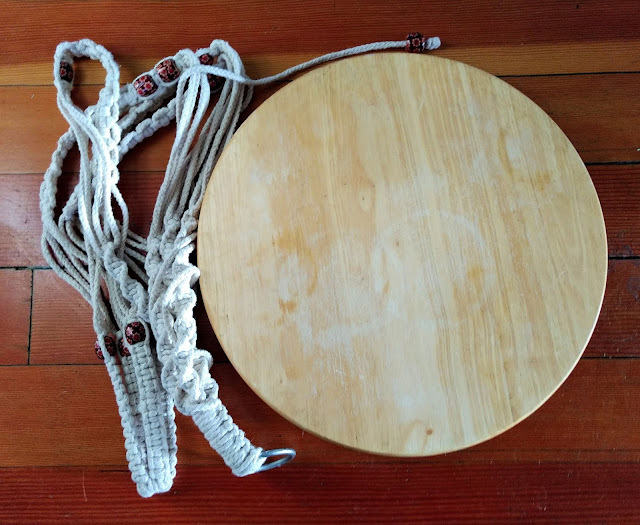 These two thrift store items were purchased separately--a cute, boho plant hanger and a lazy Susan. I bought the plant hanger for, well, a plant and I always buy lazy Susans, if the price is right, for round signs and small table tops. I never intended to use the two together, but I spied both of them at the same time hanging out in my craft room (i.e. 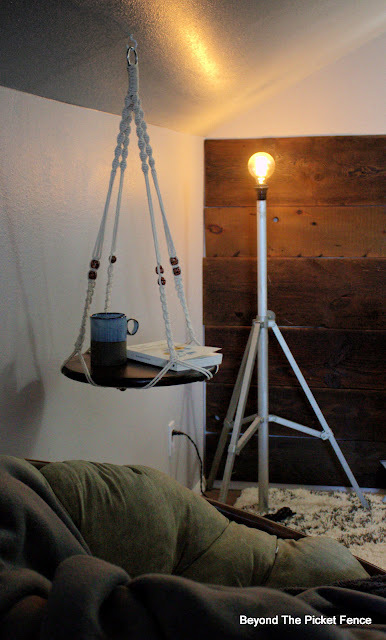 glorified laundry room) and ding, ding, ding--I had an idea, a hanging side table! I removed the lazy part or the spinning part from the lazy Susan and lightly sanded it and stained it with espresso colored stain. A clear coat finished this really (cue sarcasm) difficult project. 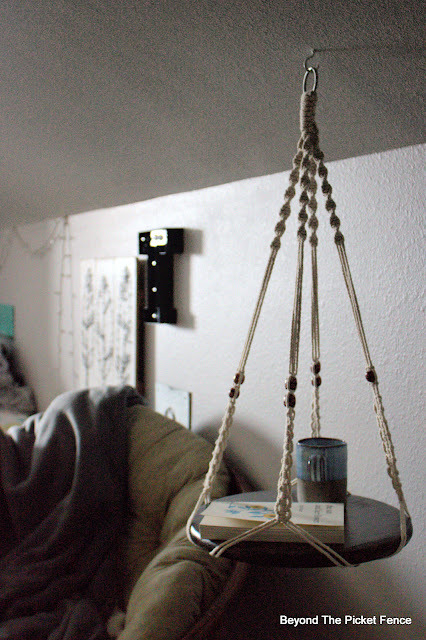 I set it in the plant hanger and that was all it took to make a perfect hanging side table. 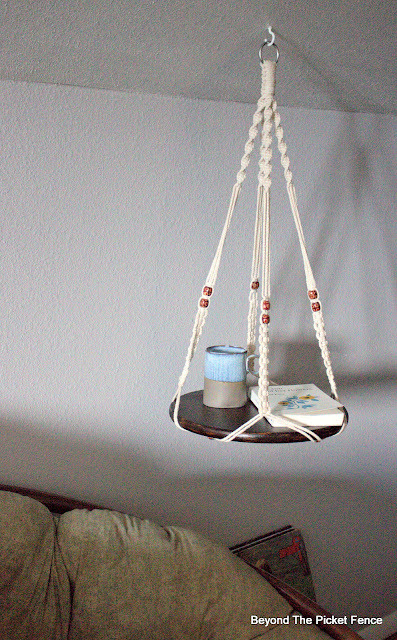 I hung it near my daughter's papasan chair, that sits in a cozy corner of her bedroom. The slanted attic ceiling was the perfect height for the hanging table. Her turntable, aka record player, sits nearby and it is a perfect spot to have a cup of tea and read. If you need to hang it from a higher ceiling, you could use chain or rope or laundry line to hang the plant hanger from the ceiling. Oh, and the lamp? A thrift store tripod and a lamp kit! 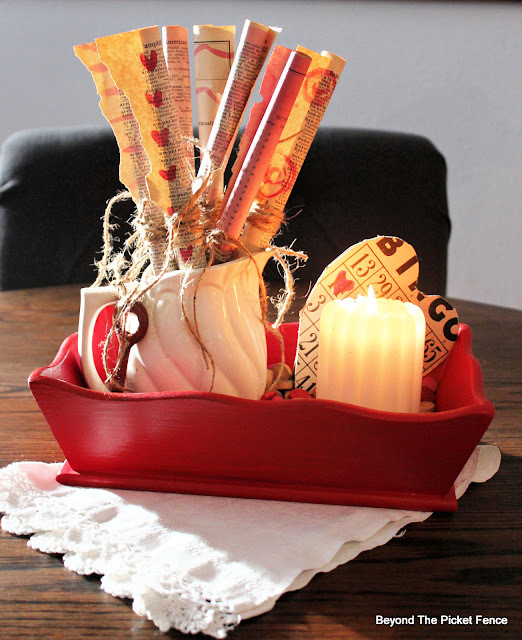 Do you remember making valentine boxes for school? I loved wrapping a cardboard shoe box in construction paper and then plastering doilies and hearts all over it with white paste that I may or may not have enjoyed eating (ew?!!). 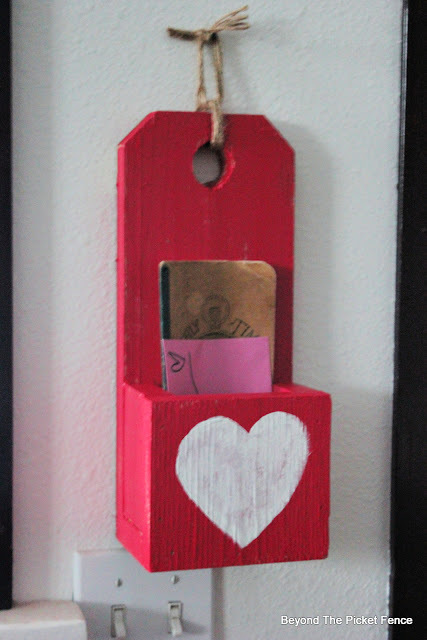 I decided to make a grown-up, farmhouse style, valentine box from some scrap boards. Happy Sunday! This year I am trying to practice some moments of stillness and quietness, and it is hard. We live with so much noise and distractions and big gestures that it is difficult to recognize the small, but important moments. 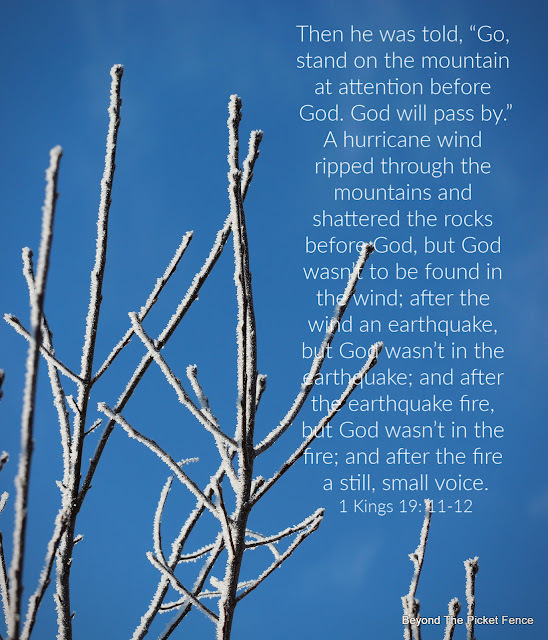 God certainly can speak to us in big, dramatic ways. But, he often wants to get our attention in a small, quiet voice: a friendly smile, a generous act of a neighbor, a song, nature. I wonder how often I miss God because I am looking for the spectacular and I don't hear his gentle whisper. This week let's look for God in the ordinary, every day moments where I know he is waiting for us to simply pause and be still and hear his quiet, loving voice. With Christmas all put away, I decided I need a new centerpiece. I thought about a wintry one, but chose to jump into Valentine's Day. became a primitive dry sink or bucket bench. In the past, a dry sink would have held a pitcher and bowl for cleaning up. It often has an upper towel bar or closed shelving under the top tray area. 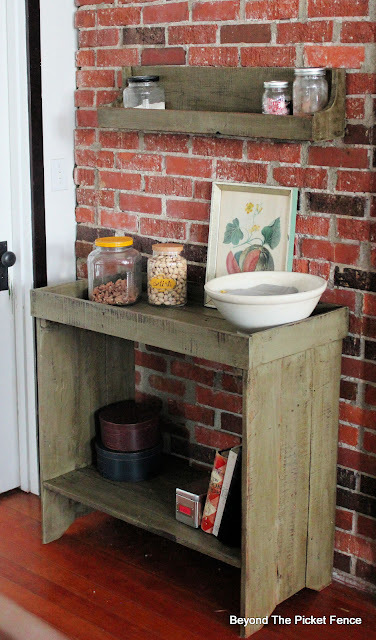 A bucket bench was often kept outside a home and held buckets of water for clean up and other uses inside the home. 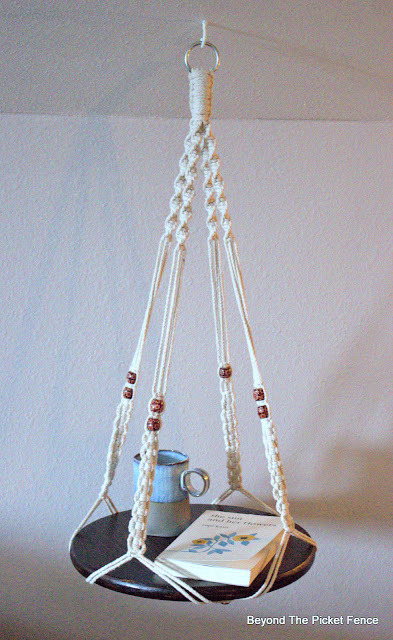 I decide this piece is sort of a combination of both primitive furniture pieces. Happy Sunday! It's a new year, a fresh start--does that excite you or scare you? I have seen this quote a lot in the past week: "Today is the first blank page in a 365 day book, write a good one." And while that is true, it stresses me out. What if my first page (January 1) was poorly written--a day spent putting things off and eating too much junk food and being lazy? Did I ruin the whole book? The truth is, each day we get a blank page and a new chance. With God we can't ruin the book with a bad day, a poor decision, or when we totally "screw it up". God's fresh pages never end, he is faithful with new mercies (i.e. compassion, grace, forgiveness, charity) each and every day. 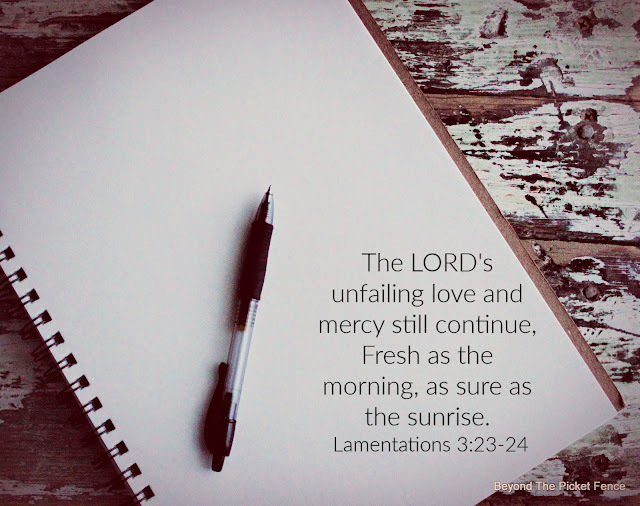 Be encouraged knowing that God's love never fails and that his mercy is ALWAYS fresh. 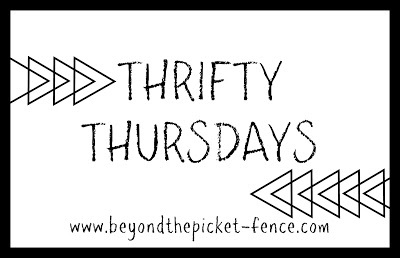 Happy New Year and oh, happy day, Thrifty Thursdays are back! 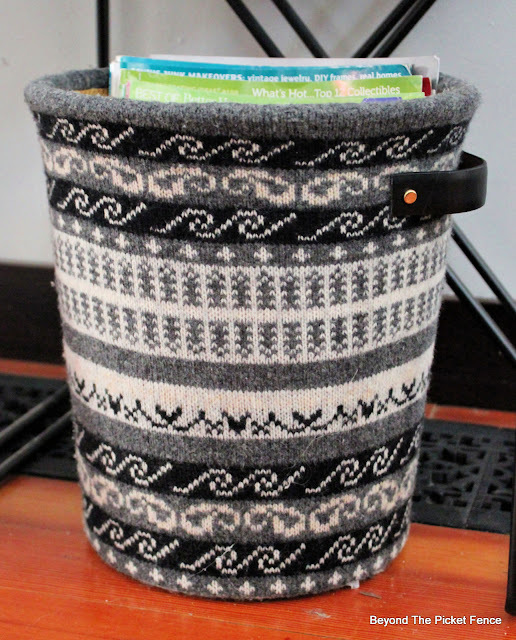 Once a week (most weeks) I will share a project made with easy to find thrift store items. 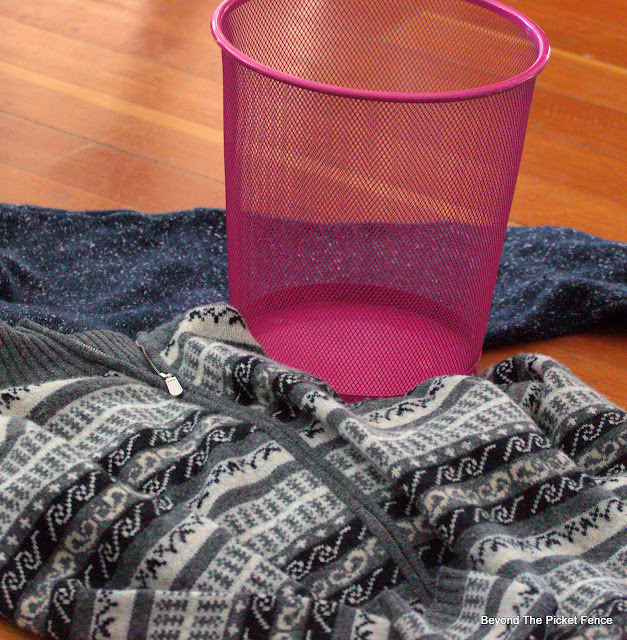 This week's project started with a couple sweaters, a wire waste basket, and a leather belt (not pictured). 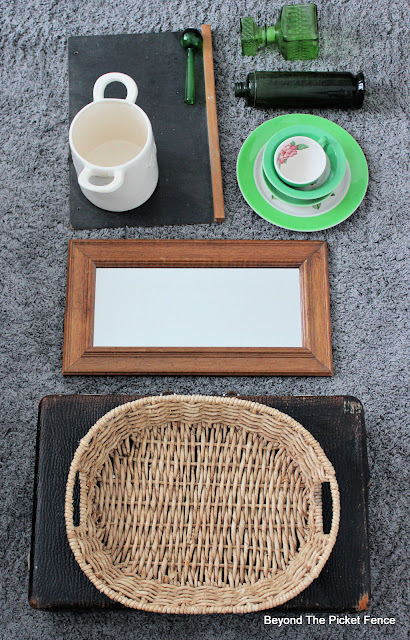 An hour, and these simple thrift store items, plus a few supplies, and I have a cozy sweater basket or container, perfect for winter decor.